He was elected as Judge of the Constitutional Court the 22 November 2016. He has been member of the Constitutional Court since 1st December 2016. He graduated from the Faculty of Law of Eötvös Loránd University in 1993. From 1993 to 1999 he worked as an advisor at the Constitutional Court. Between 1999-2002 he was head of the Department of Church Information and Coordination at the Ministry of National Cultural Heritage. Between 2003 and 2007 he worked again at the Constituional Court. In 1996 he took the bar exam, in 1999 he was awarded the license in canon law, in 2003 he gained the PhD title and he habilitated in 2010. He was granted full professorship in 2012. His main field of interest is the constitutional law and the state regulation of churches. 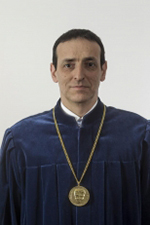 He was teaching at the Faculty of Law of Eötvös Loránd University and at the Pázmány Péter Catholic University, where he became head of the Department of Constitutional Law in 2006 and where he was dean between 2007–2013. In 2016 he was chairman of the „European Consortium for Church and State Research.